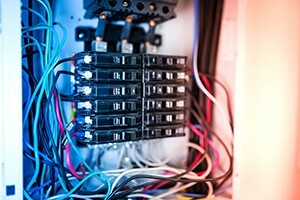 The main electrical panel is the heart of your home's electrical system and the distribution point for all the electric circuits in your home. We guarantee that all materials used will be as specified and up to the code in your area. And, we guarantee to protect the condition of your home. Circuit breakers are sensitive to various factors. Your home's electrical service panel consists of a series of circuit breakers and fuses that allow you to control all the electrical components of your home. The electrical panel divides all the electrical power into different circuits, each of which is protected by a circuit breaker. The demand on your power panel increases as electrical appliances and circuits are added to your home. Your power panel may need to be replaced or a sub-panel added to keep up with demand, depending on when your home was built and how much electricity you use. Faulty wiring issues - The risk of a fire caused by faulty wiring dramatically increases based on how old your house is. Older wiring may not meet code, and wire insulation and other materials tend to deteriorate over time. Flickering lights, a slight shock when you touch appliances, persistent burning smell or power outlets that are discolored or spark, are sign warnings signs of faulty wiring. Excessive use of extension cords and power strips - If you are using a lot of power from one outlet via power strips and extension cords, you should upgrade your electrical panel to allow each circuit to run straight from the panel or install a new outlet and circuit. Replacement of fuses with circuit breakers - Fuses and circuit breakers both prevent circuit overload by disrupting electrical currents that flow to any connected devices. However, fuses will melt if a current is running at too high of a level, interrupting the flow of electricity. Circuit breakers simply have to be reset. Fuses were designed during a time when homes didn't have so many things plugged into the outlets. Some insurance companies will not insure homes that still use fuses since they can pose a fire hazard if overused. Installation of new appliances - If you plan to install an appliance that consumes a lot of power, like a refrigerator, or even a new hot tub, your electrical panel may not have enough power to keep those appliances going. You may need to upgrade to a panel with more power amps if the circuit breakers trip any time you turn on that appliance. Changing out or upgrading your electrical service is a job for an experienced electrician. Call our experienced electricians at Direct Energy Home Services/electrical to go over your options and provide quality installation service that will increase your safety and peace of mind knowing that the heart of your electrical system is working properly.